November 2011 | It`s full of stars! 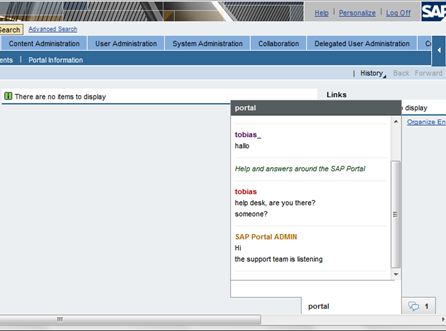 Can a neat chat application seamless embedded into the SAP Portal add value to your portal? 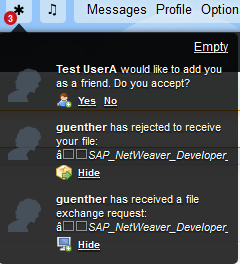 The SAP Portal comes with a build-in chat application. This application once was a very nice additional feature, not really user-friendly, but useful for easy out-of-the-box chat in the portal. Unfortunately, the chat application received a feature freeze some time ago and today looks just … old. It`s one of the portal functionalities ready to use, but no one does. 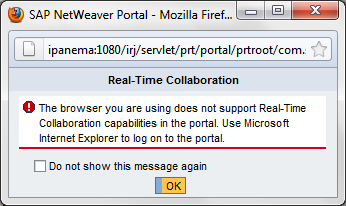 That`s sad, considering that a chat application inside the portal can add some nice functionality to the end-users portal experience. Partly the chat application is to blame (see screenshot above), but still: chat in a portal can add serious value and drive user adoption. Most chat applications have to be installed on the desktop or the online version requires a new window or consumes too much space to be easily integrated into a portal page. If you are familiar with Liferay you already know the chat functionality available there and how easy it integrates with the portal pages (of the facebook chat). Besides having a nicely integrated chat application in the portal and therefor raising the acceptance by end-users, an integrated chat can be used as a communication channel. 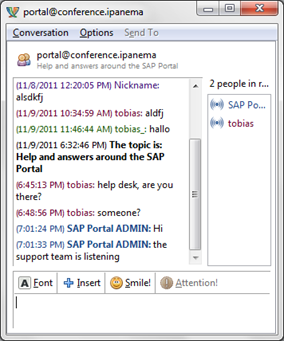 Integrate a chat room on a portal page gives the users the possibility to ask instantly questions about the application or content, without the need to open a support message. Is this possible with the SAP Portal and how does this look like? Short answer: of course it is possible! People can log on anonymously to the chat or with their credentials. History can be kept so that new joiners can browser previous questions and answers. The user can click on the chat area to log on anonymously to the chat group for that page / LoB and asks for help. The support stuff can use their preferred chat client (here: Pidgin) to receive and answer questions of the users in real time. 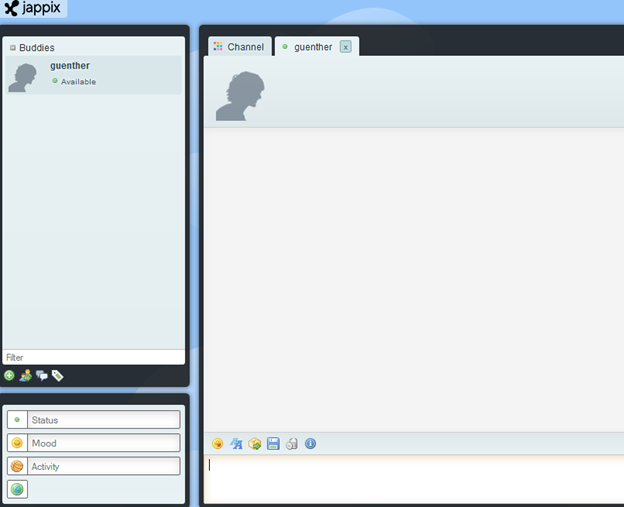 The answers will pop up automatically at the chat window of the users logged on to the chat room. 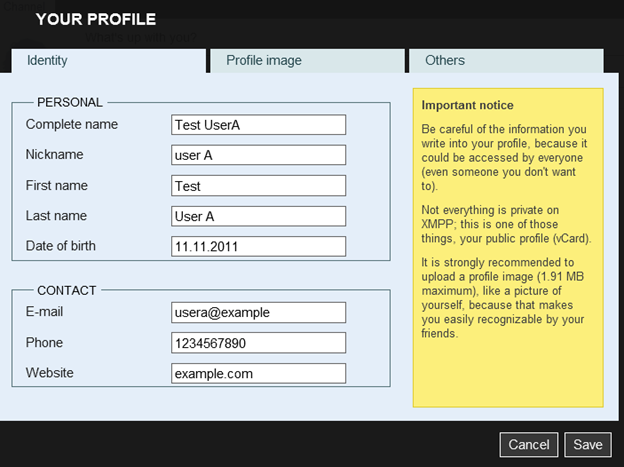 A hidden feature is the ability to send messages to all registered users. 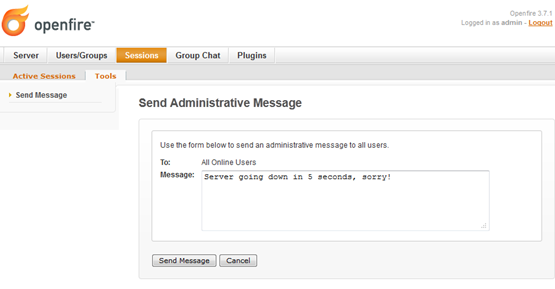 Just put the chat application with automatic logon on a static part of the portal and send a message to all users connected. The message pops up automatically. The anonymous users are listed as session users, but not with their user Id. The user Id of the portal user can be used as the nickname when registering to the chat room. Therefore the username can be found in the chat room administration. Other use cases: this chat application can also be used to track the actual number of users active in the portal and, with real log on to the chat, to interact with them. My magic didn`t work too well for IE (irony), but that’s related to the CSS used. There is also a mobile version of Jappix available. 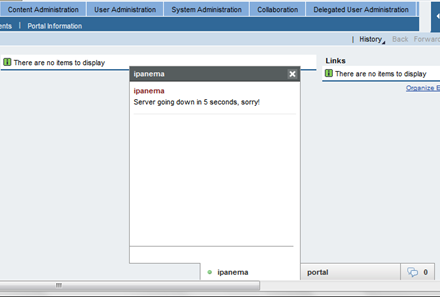 Combined with the portal navigation this can be used to redirect mobile users to a mobile support forum. 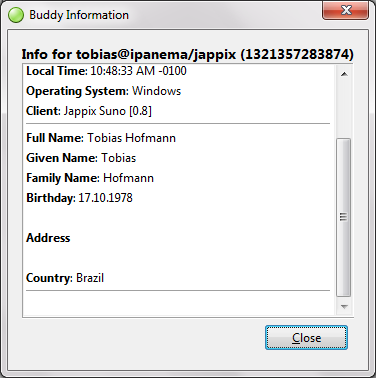 User information can be displayed as they are configured in the user DB of the chat server. The web client is using the HTML5 location feature, so the actual location of the user can be displayed as well. As I’m one of the topic leaders I gained a voucher for a SAP certification. SAP certification isn’t really cheap (normally in the range of 500US$ to 750US$), so this is a good incentive to study and go for a certification. The voucher is not bound to a specific certification or topic: I can choose from whatever certification SAP offers. Of course it only makes sense to go for a certification test that I can pass. In my case: SAP Portal related. Already certified as a technology consultant I wanted to extend my certifications to either development or solution consultant. Not being really a developer – I write POCs (aka the fun part of developing) – I opted for the solution consultant. The KM isn’t the greatest product, but it offers some nice features and the certification covers TREX too! R.I.P. C_TEP30_04s. I never had the chance to know you. This certification is also marked as “under development”. I hope that this doesn’t mean that this certification is also going to die. Another alternative is to go for the higher levels of the technology consultant certification. 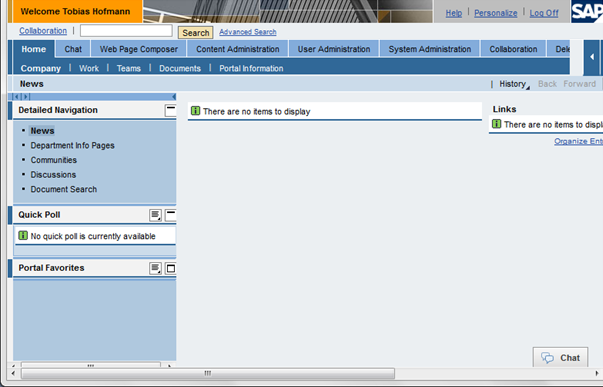 But the SAP education site only showed me associate and no professional certifications for portal. 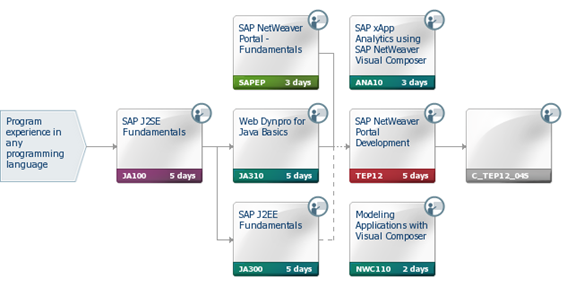 Are you C_TEP30_04s certified or planning for a SAP Portal related certification?